Pic St. Loup Mountain and Wine Region in northern part of Languedoc, Sud de France. Pic Saint-Loup in Côteaux du Languedoc produces some of the finest wines in the Midi. As a sub-appellation of the Languedoc AOC, it is petitioning vigorously, and successfully, to become its own appellation. Many foresee that it soon will succeed in these efforts. 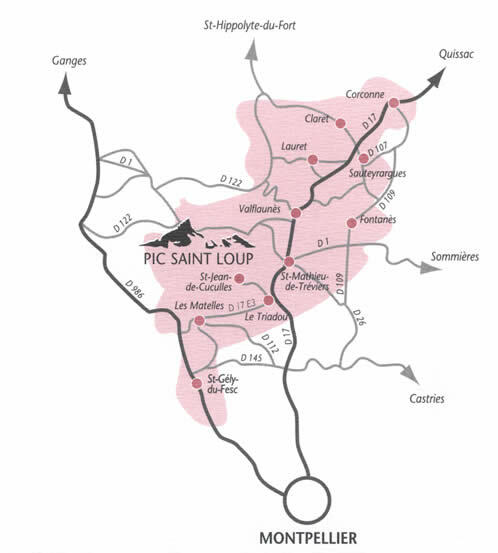 “The vignerons of the Pic Saint-Loup have been very smart to identify their appellation with the majestic mountain of Pic St. Loup,” comments a compatriot winemaker from the Murviel-les-Montpellier sub-appellation just to the south of Pic Saint-Loup. The Coteaux du Languedoc appellation was replaced by the appellation Languedoc AOC in 2007, but the two names will run concurrently until 2012. The majestic peak of the St. Loup mountain is a dominantly identifying landmark for this notable region in Sud de France and it conveys the inextricably linked mark of the terroir, that of its cooler elevated vineyards which are set apart from the lower, and hotter, Languedocien plains. Pic St. Loup, left; Hortus Mountain, right. Thirty kilometers from the southern French coast, the climate is Mediterranean with the characteristic aromatic haut garrigue perfuming the terrain. The topography of the area, dominated by these two distinctive mountain peaks – Montagne de l’Hortus and Pic St. Loup itself – to the north and east means increased diurnal temperature variation which is an essential factor in the development of balanced acids and sugars in the wine grapes. The Pic St. Loup is only red and roses. White varietals are grown in the appellation but are not bottled under the Pic Saint Loup AOC classification. Only reds are honored with that with the whites receiving a Coteaux du Languedoc, or the local Vin de Pays du Val de Montferrand also for the roses. The principal grapes must be Grenache, Mourvedre and Syrah; a vintage must contain at least two and must comprise at least 90% of the blend. At least 20% of that must be Syrah, a vine that is not indigenous to the area, but was planted early last century, along with Mourvedre and Grenache, as cépages améliorateurs, during the re-planting of the country’s vines. Maximum yield is 45 hl/ha, minimum alcohol is 11.5% and the vines must be at least 5 years old. These conditions will only become steeper when the INAO accepts their petition for AOC classification. Other varieties in the blend can be Carignan and Cinsault which are allowed a maximum of 10%. The mesoclimates of this limestone dominated terroir allow for the viticulturists to plant the heat-loving Mourvedre in the warmer, lower vineyards and use the higher vineyards to grow a more elegant style of Syrah, which responds well to the cool mountain nights. Lascaux is French for limestone rock, and Jean-Benoît Cavalier has 35 hectares of vines on a series of stony terraces located just north of the village of Vacquires. He took over from his father in 1984 and is now one of the leading growers in the appellation. His best wine, Les Nobles Pierres, is a blend of 80% Syrah and 20% Grenache. That was back in 1987. He keeps his yields low, approximately 25-30 hl/ha and harvests by hand. He maintains 80% red varietals and 20% white varietals under cultivation, with the entire domaine under Pic St. Loup AOC classification. Woah! I’m really enjoying the template/theme of this blog. It’s simple, yet effective. A lot of times it’s challenging to get that “perfect balance” between usability and visual appearance. I must say you have done a fantastic job with this. In addition, the blog loads super quick for me on Chrome. Superb Blog! I like Your Article about Virgin olive oil! Perfect just what I was looking for! . obviously like your website I’ll certainly come back again. This is extremely attention-grabbing, You are a pro blogger.